According to analysts, the big data market has been predicted to be USD $50 Billion by 2019. Hence, Data Science or Big Data Analytics has been one of the most Hot trends among students and working professionals in recent times. Companies are gently classifying technological trends to determine how they can push to achieve their goals. One such recent trend is the use of big data analytics, and it’s scope is surprising. Big Data is everywhere and there is almost an urgent need to collect and preserve whatever data is being generated, for the fear of missing out on something important. Big Data Analytics has become crucial as it aids in developing business, decision makings and providing the biggest boundary over the competitors. If you’re looking to make a career switch, big data offers profitable opportunities. This article outlines a few reasons why making the switch for a career in big data analytics is a great idea, and why you should do it as soon as possible. How Big is the Big Data? Everyday business and consumers life creates 2.5 quintillion bytes of data per day. 90% of the data in the world has been created in the last two years only. According to the ‘Accenture 2015 Trend Report – Big Data Analytics’ survey, it was concluded that Big Data Analytics is one of the top priorities of the organizations participating in the survey as they believe that it improves the performances of their organizations. In any economy, the general rule is – if demand exceeds supply, the price will tend to be high. Strong demand for Data Analytics skills is upgrading the wages for qualified professionals and making Big Data pay big bucks for the right skill. In India, the demand of people with good knowledge of Big Data Analytics is huge and currently there is a huge shortage. At entry level in Data Science, Data Analytics or related field can fetch a pay package of 4 – 10 Lakhs per annum. Professionals with 3 – 6 years and 6 – 10 years of experience can expect annual salary of 10 – 20 Lakhs and 15 – 30 Lakhs respectively. With 10 – 15 years of experience it is also possible to earn an annual package of more than 1 crore. All the salary figures are as per as the reports by Analytics India. 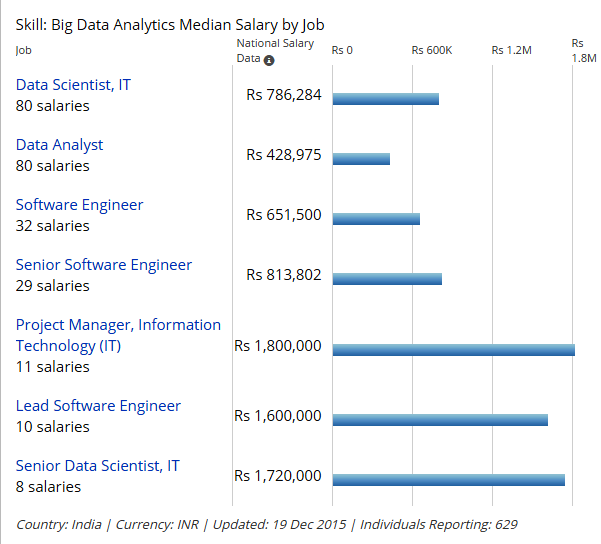 Please also see the median salary report in the Big Data Analytics domain in India by PayScale.com below. A Forbes article on Big Data jobs in 2015 stated that “The advertised salary for technical professionals with Big Data expertise is $104,850 net of bonuses and additional compensations. A huge cluster of organizations like Ayata, IBM, Alteryx, Teradata, TIBCO, Microsoft, Platfora, ITrend, Karmasphere, Oracle, Opera, Datameer, Pentaho, Centrofuge, FICO, Domo, Quid, Saffron, Jaspersoft, GoodData, Bluefin Labs, Tracx, Panaroma Software, and countless more are utilizing Big Data Analytics for their business needs and a huge job opportunities are possible with them. The above graph (google trend: big data jobs) depicts the job trend graph for Big Data Analytics, proves that there is a growing trend for it and as a result there is a steady increase in the number of job opportunities. The number of job posting relating to Big data and analytics is growing significantly. If globally this is the scene, India is also not far behind as the country has major Big data hubs coming up, especially in cities like Bangalore and Delhi. This is why companies are willing to invest the time and money required to find the right people and help them develop their skills. The study also says that 74% predict Big Data will be in mainstream use in at least one business unit or department. Big Data Analytics is used everywhere. Based on an analysis by Wanted analytics it was found out that the top 20 industries hiring Big Data related expertise include Professional, Scientific and Technical services(27.14%), , Manufacturing (12.35%), Finance and Insurance (18.89%) and Retail Trade (9.62%). Analytics is a key competitive resource for many companies.According to "Peer Research Big Data Analytics survey" About 49% of the respondents strongly believe that analytics is a key factor in better decision-making capabilities. Another 16% like it for its superior key strategic initiatives. Forbes reported an increase of more than 80% in demand of Data Analytics professionals between 2013 and 2014. There was a 123.60% jump in demand for Information Technology Project Managers with big data expertise, and an 89.8% increase for Computer Systems Analysts in the same period. According to Forbes in 2015, the top sectors with the most job openings requiring big data expertise include Professional, Scientific and Technical Services (27.14%), Information Technologies (18.89%), Manufacturing (12.35%), Retail (9.62%) and Renewable Energy, Sustainability, Waste Management & Remediation Services (8.20%). Demand for big data talent is booming. It is an incredibly advantageous time for you. This is your market, where companies are competing for your talent. You can seize the opportunity if you are proficient in Big Data tools.